Nuclear medicine is rapidly facilitating the shift from “trial and error” medicine to personalised medicine, which holds great promise for improved patient outcomes. This was said by Prof Mike Sathekge, professor and Head of the Department of Nuclear Medicine at the Faculty of Health Sciences, at the University of Pretoria and Steve Biko Academic Hospital. He was speaking at the 22nd lecture in the UP Expert Lecture Series. These lecture series are a public platform for UP researchers to engage with a general audience on significant developments in their fields of expertise that are likely to have an impact in the future. In his lecture, titled, ‘Theranostics: See it, treat it!’ Prof Sathekge explained that there is an escalating medical economic burden on patients with cancer, which is in part attributable to the gap between diagnostics and therapy. He focused on how the “see it, treat it” approach increases the quality of clinical care and ultimately could save costs through helping to identify the right therapy, for the right patient at the right time. According to Prof Sathekge, the goal of targeted radionuclide therapy is to “selectively deliver radiation to cancer cells and/or diseased tissue with minimal toxicity to surrounding normal tissues”. The Theranostic (See it, treat it) approach is the basis for successful radionuclide therapy as it integrates diagnostic testing for the presence of a molecular target for which a specific treatment/drug is intended. He explained that Theranostics was a revolutionary approach that promised improved therapy selection on the basis of specific molecular features of disease, greater predictive power for adverse effects due to improved patient-specific absorbed dose estimates, and new ways to objectively monitor therapy response. 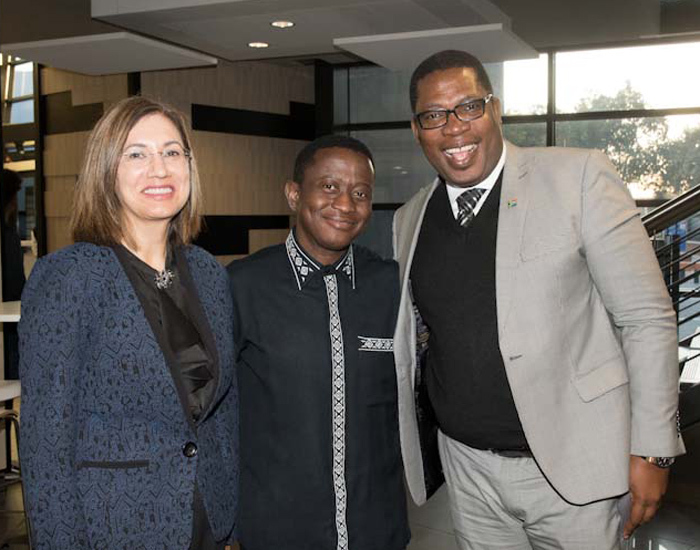 UP Vice-Chancellor and Principal, Prof Cheryl de la Rey, Prof Mike Sathekge and Gauteng Education MEC, Panyaza Lesufi at the lecture. Prof Sathekge holds the degrees MBChB (Medunsa), MMed (Nuclear Medicine), PhD (Ghent), and is a member of the Fellows of the Academy of Medicine in Singapore. He is President of the Colleges of Medicine of South Africa and Chairperson of the Board of the Medical Research Council of South Africa. Internationally he is the immediate past president of the International Society of Radiolabeled Blood Elements and past secretary- general of the World Federation of Nuclear Medicine and Biology. He is on the governing body of the World Association of Radiopharmaceutical and Molecular Therapy.